Compare prices on car hire in Oslo from all the major brands and find the best deals. When you book through us, unlimited mileage and insurance are always included in the price given. Oslo, with about 590,000 inhabitants (2010), is the capital and largest city. It is located in the central eastern area of ? ?southern Norway – the head of Oslo Fjord. Several rivers run through the city – including the Aker River. Oslo was founded around the year 1048, and became the capital until 1314, later in 1814 – when the union with Denmark was dissolved. 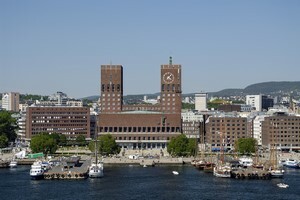 The city has an important port with ferry connections to both home and abroad, and both the Oslo fjord and the hills surrounding the town is popular destination for outdoor recreation. The capital has a rich cultural life of over 50 museums, numerous art galleries, opera, theaters, concert venues and nightlife venues. Some of the most popular tourist attractions in Oslo’s Royal Palace (Royal Palace) – which is the Norwegian king’s main residence, Castle Park, the main street “Karl Johan’s gate” (which stretches from the Central Station in the southeast and up to the castle to the northwest) – with popular business district on both sides of the street, Oslo Cathedral from 1697, the Parliament, the National Theatre from 1899 – and the old University buildings. Other attractions include Akershus Fortress (originally from 1299), Old Aker Church from the 1100s (the city’s oldest building), the Holmenkollen ski jump with ski museum, Frogner Park with Vigeland Park (Sculpture Park), the National Gallery with its collection of Edvard Munch’s pictures, the Kon-Tiki Museum, Fram Museum , Norwegian Maritime Museum and the Ibsen Museum. Of the newer attractions to the Opera House is mentioned. It is located in Bjørvika – and was inaugurated in 2008. Oslo Airport – Gardermoen is Norway’s largest airport and is approx. 50 km north of downtown. Car hire is available at several locations in Oslo, including the Oslo Airport Gardermoen , Asker Train Station, downtown and Økernveien.We guarantee low prices on car rentals in Oslo. Try the search engine above to check rates and availability for rental cars.